It’s not very often we review books here at The Music Universe. 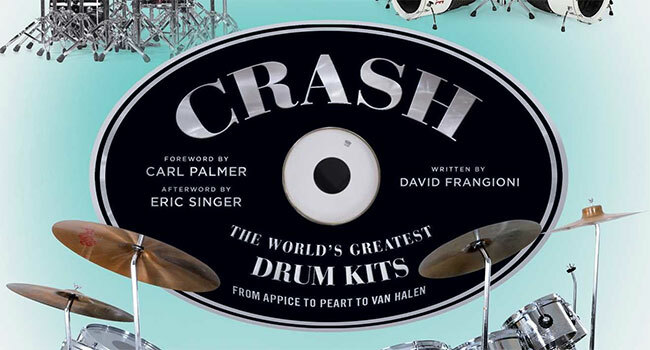 I’m not much of a reader myself, but as a drummer, David Frangioni’s Crash: The World’s Greatest Drum Kits From Appice to Peart to Van Halen was something I had to get my hands on! The book features a very cool collection of rock and roll’s greatest drummers and their babies — their drum kits. Anyone who is anyone in rock and jazz drumming is featured in Crash. Neil Peart? Carmine Appice? Alex Van Halen? Mike Portnoy? Tommy Lee? Keith Moon? Buddy Rich? Eric Singer? Yup! They’re all there, and more! This book outlines some of the world’s top drummers in all genres and their amazing kits they may or may not be known for. The book makes it easy to find your favorite drummer as they’re alphabetized with the kit(s) that are highlighted by each drummer. Thirty-six drummers and fifty-six drum kits are discussed in more than two hundred pages of hardbound pressing. Beautiful full colored images of each drum kit accompany the text. Iconic rock photographer Mark Weiss recreates each kit, staging them against a clean black or white background to show these beautiful specimen in great detail. There’s plenty of text that gives the reader an intro about each drummer and kit, but the stories each drum set tells visually is just as stunning. No spoilers here, but fans get a closer look at iconic kits like never before. Learn more about Jason Bonham’s Ludwig Led Zeppelin Reunion kit, Peter Criss’ Pearl 1970s KISS Destroyer Tour kit, jazz legend Steve Gadd’s 30th Anniversary Yamaha Signature Recording Custom kit, Joey Kramer’s Drum Workshop (DW) Collector’s Series kit he played during Aerosmith’s Nine Lives Tour in the 1990s, Buddy Rich’s Slingerland Classic kit, Neal Peart’s Rush R30 Tour kit from DW, Mike Portnoy’s Tama Dream Theater Custom Logo kit and many more. This book is a must-have for every drummer from novice to professional! Many of the above (and then some) are my heroes who have inspired me in some way or another. Seeing an up close and personal look at these drum kits is something unique and fresh that is very inspiring in other ways. It also makes me want to play better and more often and strive (once again) to join the elite ranks of these road warriors. There’s only one question I have to ask… Where’s John Bonham?